I think I may have gone overboard (OK, I did) with the embellishments on this one. I kept feeling as if there was "just one more empty space" that needed to be filled. LOL! It's not my favorite layout, but the colors and photos and the memory of the day definitely make me happy. this is so fun! so bright and cheery! So much to love about this layout! I love that you kept it all within the circle. And the fun layering of product. This is FABULOUS!!! I love love love the photos, the colors and loveeeeeeeeeee the big scalloped circle enclosing everything in!!! A totally fun and happy page, Lisa. Alexa is so cute with all her plans and personality! I love the way you used vellum under the circle to soften the pattern. Great layout! This is amazing! I love all the layers of embellishments. It's like they tell the story all by themselves. Gorgeous work! Love all the little embellishments! Very fun! 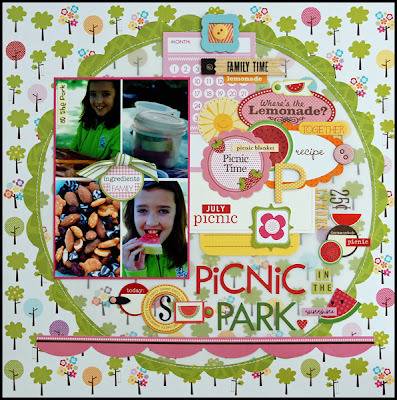 Love the photos all grouped together and the fun mix of colorful embellishments! So fun and colorful - love all the embellies. And the pix are perfect. This is so adorable! So much happiness of a page! What a sweet memory and page! Cute! Love that she planned it all herself! Makes it that much more special!! I don't think you over did ~ it helps tell you story with all the goodies on the layout~super cute Lisa!!!! so many awesome bits on here!